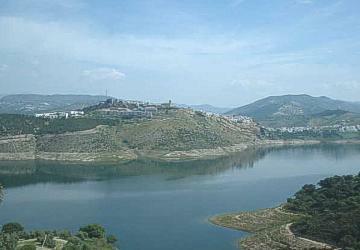 The nearby, unspoiled, traditional white walled, red roofed village of Iznajar, with its castle dating from the 8th century and church from the 16th century, has spectacular views over a 32 km long lake which hosts a variety of water-sports and fishing. There is a beach on the lake where you can swim, rent pedalos and canoes, and learn to sail (and possibly other water sports). It tends to be busier on Sundays but is very quiet during the week, even in the height of the season. The water is beautiful to swim in, the bathing is safe and the beach has sand to lie on or for children to play in. N.B. The information provided on this site is based on the knowledge available at the time of writing and no responsibility can be accepted if other businesses mentioned are no longer operating. The resorts of the Costa del Sol, Costa Tropical, and Costa Almeria are all easily accessible by car being 45 minutes to the Costa del Sol and up to 1½ hours away to Costa Almeria. Why not extend your holiday with a visit to a second location. Spain holidays can help you find accommodation at any of the above resorts and many others. A day shopping could be just the answer to mop up your residual holiday cash or foreign currency!